An endemic bird to New Zealand, the Kaka dwells mostly in the depths of the forest throughout the country. As we take this picture of the Kaka Bird at the Pukaha Mount Bruce National Wildlife Centre on the North Island of New Zealand, the bird pays close attention to the events going on around him. 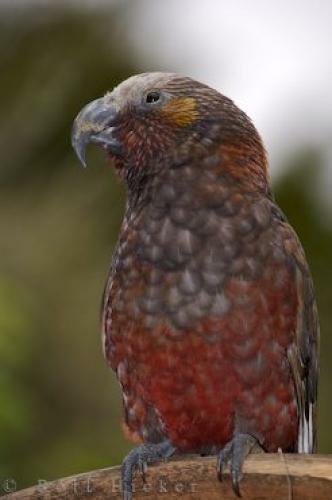 The Kaka Bird is on the endangered species list and the people that work at the Pukaha Mount Bruce National Wildlife Center are doing everything possible to make sure the Kaka can be saved. The National Wildlife Center in New Zealand is a captive breeding establishment and various birds like the Kaka are slowly being reintroduced to their natural environment. The Pukaha Mount Bruce National Wildlife Center is a unique place to visit while in Wairarapa, New Zealand and gives you the opportunity to snap a picture of some rare species of birds like the Kaka. An evening visit is more exhilarating as you can listen to the extraordinary calls of the forest life. Kaka bird, Nestor meridionalis, at the Pukaha Mount Bruce National Wildlife Centre, State Highway 2, Wairarapa, North Island, New Zealand.